Bali is not just a tropical getaway and a honeymoon hotspot, it’s also a paradise for surfers! Bali and the surrounding islands have some great surfing beaches, with beach breaks for beginners and huge barrels for the pro’s. You need to know the characteristics of the waves to find a surfing spot that fits your level so you don’t end up in a whirlpool of thundering waves. Here are the best five surfing spots in Bali based on their level of difficulty. In all cases: Respect the local surfers (don’t drop in before them) and be careful around shallow water! The easiest and most beginner friendly beach to try your surfing skills is Kuta beach. The beach is close to the nightlife and tourist center of Legian, hence the beach is always crowded. 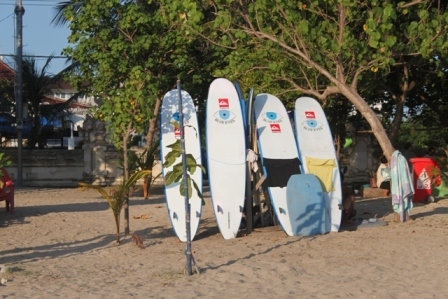 As a surfing spot, Kuta is very appropriate for beginners. The soft tide and average height of the waves make it a good first step for beginner to try out white water surfing (surfing the waves after they break and roll towards the beach). The good thing here is that there are plenty of lifeguards on the lookout, might you get into trouble (the undertow can get quite strong). Also, it might be a good idea to follow a surfing lesson (just ask one of the surfing dudes renting out boards at Kuta beach). For experts, Kuta beach’s swell will be to easy to defeat. Canggu beach is slightly more challenging, depending on the tide. Canggu is located close to Seminyak, about 30 minutes from Kuta. Canggu is a popular spot to surf just for everyone, both experienced surfers and beginners surf in Canggu. There is a variety of beach and reef breaks, with a few soft rolling waves that are ideal for beginners and some fast, rippable peaks, for experts. Canggu will be a place to have a relaxing surf with waves that aren’t that extreme (but can get rather fast!). But, when the tide is up, it can be a real challenge even for the professionals. For beginners, Canggu is also a friendly beach. The soft waves and medium tide makes learning how to surf more fun. It’s usually more quiet than in Kuta, there’s a warung that sells some snacks, but that’s about it. Keramas beach is located passed Sanur, in the direction of Gianyar. This once secret hide-away is now one of the most popular surf spots on Bali. Keramas has an excellent reefbreak, and one of the few rights on Bali. It is definitely a wave for professional surfers. Keramas beach promises constant waves and a big swell, as long as you get up early, after 07.00 a.m the onshore wind might affect the barrel. The end section gets really shallow and you should be careful with the sharp reef and annoying sea urchins. The location makes this beach less crowded compared to the others, so, if you’re looking for a world-class wave without having to battle to stand up on your board, Keramas is the place to be. I stayed at Pelan Pelan in Canggu for a surf and yoga retreat and it was perfect! The waves are great for all levels and the surf instructors were top notch. Highly recommend it for both solo travelers and couples! Teacher can speak french, english and bahasa. They are very patient and explain with many details, they are behind you during all the lesson (2h) ! Amazing experience with them ! This is their website: http://www.balioceansurf.com ! I would love to take surf lessons next week. I am a biginer. From oct 11th to 15th. That’s an awesome post, really makes me wanna be back in Bali! I have also found out about some exceptional surf camps reading this post – trying to plan my trip now – which one would you recommend most? have you tried some of them? I’ve been bodyboarding for more than 20 years always with a nice attitude respecting and being respected by people in the water until i came to Uluwatu bali. with more than 50 people in the water surfing a perfect reef break and being constantly dropped in by surfers in any wave i was paddling to, i finally got a good one, went for it and listen a surfer screaming just behind me. i push to the lip and got out of the wave.. right after this surfer starts to ask me to go close to him and when i was paddling in his direction excusing myself for getting on his way he pick a large wood stick from under water saying, this one is for your head! i continue paddling to him and when i got close i’ve got violently attacked inside the water with a wooden stick for a agro balinese surfer full of hate.. i couldn’t believe it.. i wonder if this is what surf is about in Bali.. really sad for his attitude because i will never get close to Uluwatu again and thinking to don’t come to Bali anymore.. sure is plenty of better breaks in the world where someone can surf share waves with everybody and having fun.. until now i was sure that surf was about having a good time in the water and not being target of hate or violence from agro locals in the water.. im now super disappointed with bali just waiting for my return flight back to Portugal. will not recommend this spot to anyone willing to have a good time surfing.. specially if you bodyboard think twice before you going inside Uluwatu reef break. Very sad story. Anyone else experienced this at this site?